After installing FME Desktop, open the FME Desktop folder from the Windows Start menu and select FME Integration Console. Note: On earlier versions of Windows, FME Integration Console is located inside the Utilities folder. FME will scan your machine for any installed applications that can be extended to support FME. (For a list of applications that are searched, see Supported Applications.) The results appear in the Application column. If the status of an application is Not Extended, the Action column will show an Extend button. Press the button to extend the application. The log pane will display information. The Log will display the message Extend Successful. Note: Open the extended application to ensure that FME has been successfully extended from within that application. 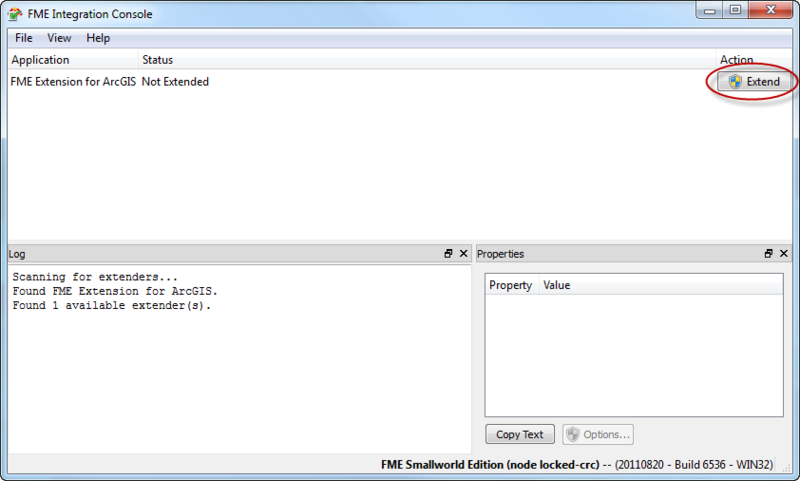 In the example above, FME is extended with FME Extension for ArcGIS. To check this extension, open the Extensions window from ArcCatalog or ArcMap (from the Customize > Extensions menu in ArcGIS 10.x) and ensure that FME Extension for ArcGIS is selected.